(FORT LAUDERDALE, FL) On Tuesday morning, November 29,2011, from 7:30 to 9:30am at the Westin Cypress Creek Hotel, 400 Corporate Drive in Fort Lauderdale, Florida, a debate forum will be held on the current legislative proposal to expand casinos in Florida. Orlando attorney John Stemberger, the President of the Florida Family Policy Council will be the sole anti-gambling voice on the five person panel which is being sponsored by the Greater Fort Lauderdale Chamber of Commerce. The forum will also feature some of the top advocates for the Casino Industry including State Senator Elyn Bogdanoff, the sponsor of the Florida Casino bill; Dan Adkins, President of the Marti Gras Casino; Bob Wyre, General Manager of Isle Casino and Racin; and Nick Larossi, Lobbyist for Los Vegas Sands. The debate will be moderated by the Editor of the Sun Sentinel Newspaper, Antonio Fins. Thirty minutes will be set aside for questions from the audience during the forum. 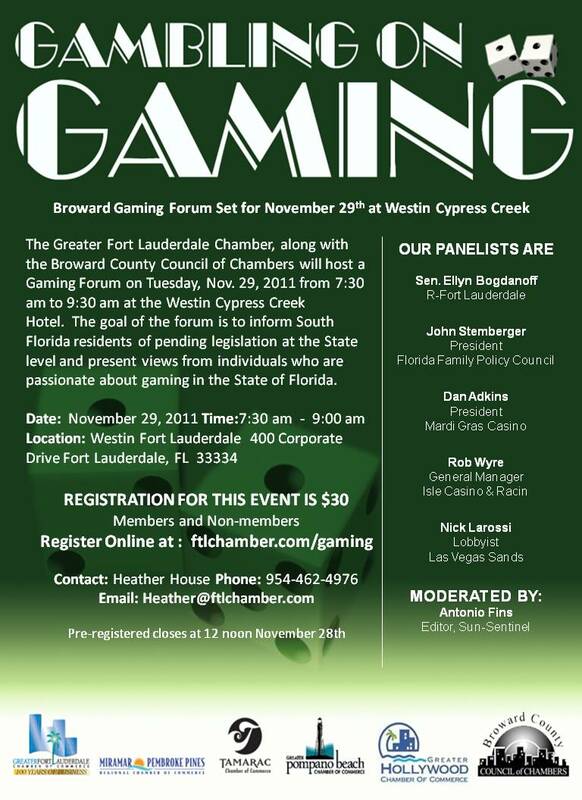 Other co-sponsors of the forum on gaming include the Mirmar/ Pembroke Pines Chamber of Commerce, Tamarac Chamber of Commerce, Greater Pompano Beach Chamber of Commerce, Greater Hollywood Chamber of Commerce, Coral Springs Chamber of Commerce and the Broward County Council on Chambers. Tickets to the breakfast event are $30.00 per person and can be purchased online at the Fort Lauderdale Chamber website www.ftlchamber.com/gaming or by contacting Heather House at 954.462.4976 or heather@ftlchamber.com. Registration closes at noon on Monday November 28, 2011.